Maximum 24 passengers per vehicle. Personal audio translation service is available on request for selected languages. All deluxe coach transfers and commentary, National Parks entry fees, Free on-board Wi-Fi, Arrive at the 12 Apostles in time for a memorable sunset. Meals are at the customer's expense - opportunities are provided to purchase lunch and dinner on tour. A sense of fun and adventure, camera, swimming gear in summer, warm clothing, comfortable walking shoes, sunscreen. Children fare applies to all children and infants from 0 to 15 years inclusive. All travellers must have a seat allocated regardless of age. Child safety and booster seats can be supplied upon request at no additional charge. Please contact us using the details provided on your booking confirmation to specify a pick-up point that suits you. If not staying in a CBD hotel, we recommend that Rendezvous Hotel on Flinders Street as a convenient pick-up location. Pick-ups are between 9.00am and 10.00am most of the year, and between 10.00am and 11.00am from November to March. The tour departs after the last pick up. 9.30pm to Midnight depending on time of year. 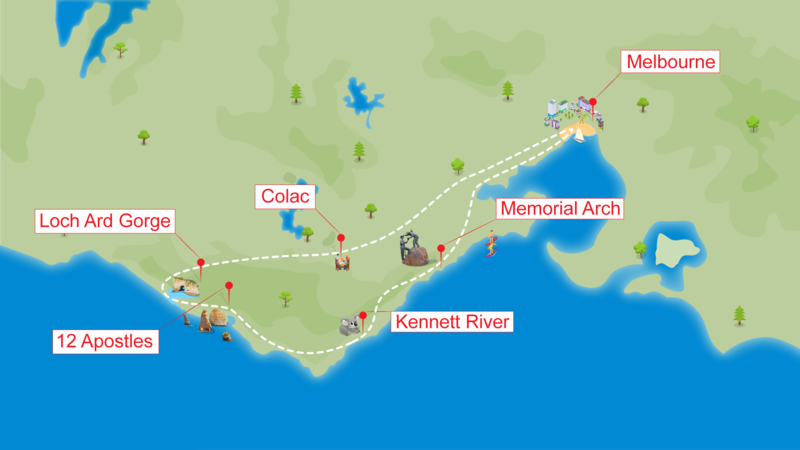 Departing Melbourne at around 10.00am [11am from November to March] we enjoy panoramic views of the city and Port Phillip Bay as we cross the Westgate Bridge, Australia's longest at just under 2.6 kilometres in length. We pass by and learn a little about Victoria's second largest city, Geelong, as we make our way towards the Surf Coast, with its enchanting beach-side towns and powerful swells. We break up the homeward journey with a dinner* stop (own expense) in the regional town of Colac. We then continue on, enjoying a stunning view of the illuminated city as we again cross the Westgate Bridge on the approach to Melbourne. With drop off right back to your inner city accommodation, you'll remember this day as a true highlight of your Australian holiday.